Last night’s dinner was an odd sort of fusion of flavors that ended up working very well together. It all started out with a bagful of greens from the community garden. 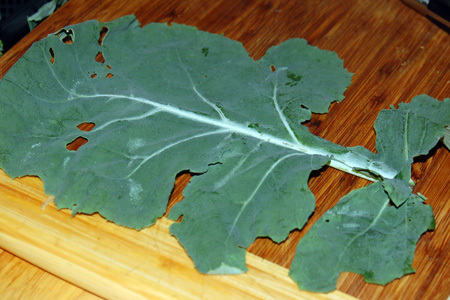 I had been told they were collard greens, but didn’t get a good look at them until I got home, and was surprised to see that the leaves had lobes almost reminiscent of some varieties of kale, with a similarly mild bitter flavor and a very tender texture. Maybe some folks in the know can weigh in on what sort of greens these actually are, because I was torn. 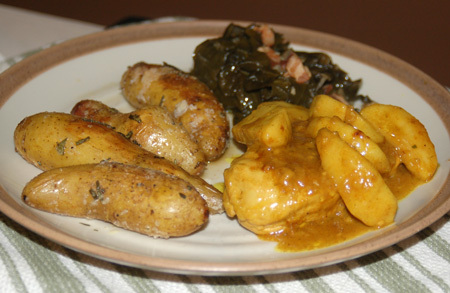 I decided to cook them like collards at any rate, braised slowly with bacon, onions, chicken stock, honey and cider vinegar. To play off these flavors, I knew I was going to be roasting fingerling potatoes with fresh herbs and braising some chicken, preferably with apples and cream, for an autumn-inspired fricassee, but without warning my Southern-French dinner took an Asian turn. Shallots and tarragon morphed into shallots, garlic and ginger with sweet curry powder, a more complex flavor that played off both the tender apples and sweet-tart-savory greens. And although the crisp-creamy texture of those roasted fingerlings would have been at home on virtually any plate, they were delicious sopped through the curried gravy. Add the white wine, lemongrass and curry powder to the saute pan and simmer briskly until it has virtually all boiled off and only a paste remains. Immediately add the chicken stock and heavy cream, and stir to combine; return the chicken to the pot, skin-side up. Reduce heat to bring the mixture to a slow simmer, cover, and cook for 15-20 minutes, until just cooked through (bone-in pieces may take a few minutes longer). Remove the lid, add the apple slices around the chicken, and turn up the heat to medium high, enough to get a hard simmer. Cook for several more minutes, until the apples are tender and the sauce has thickened and reduced to a gravy-like consistency. Taste and add salt and pepper if necessary. Source: Freely adapted from Epicurious. Preheat the oven to 450F. Bring 4 quarts of water to a boil, and cook potatoes for 10 minutes (15 minutes if very large). Drain and plunge into a bowl of ice water. Drain the potatoes in a strainer. Meanwhile, combine olive oil, salt, pepper and herbs in a small bowl. Pour over the potatoes in the strainer and simultaneously toss with your other hand until they are evenly coated with the oil mixture; any excess will drain out under the strainer, so keep it in the sink or put another bowl underneath to catch it. Some of the seasonings will remain with the excess oil. Place potatoes into a shallow roasting pan sufficiently large to accommodate them in one layer. Roast in the preheated oven for 10-15 minutes until the potatoes have crisp skin with some browned spots and offer minimal resistance to a knife. Source: Adapted from The Heart of New England. They look delicious, and I’m glad you’re enjoying the garden! I am definitely enjoying the garden, and hope to make myself of much more use very soon! Not like the fricasee my grandma used to make. I think of it as such an old-fashioned, homey dish. I like the updating. They look like the collards they sell in the grocery store here. Wish you could come out with Jeremy in Oct. Glad you found the community garden, it sounds like fun.